Roast Master David Spade took a shot at SNL star Pete Davidson during last night’s Comedy Central Roast of Rob Lowe. “Pete, I actually thought you were black, but I guess you just have your dad’s ashy skin,” Spade said in reference to Davidson losing his dad in the terrorist attack at the World Trade Center on 9/11. 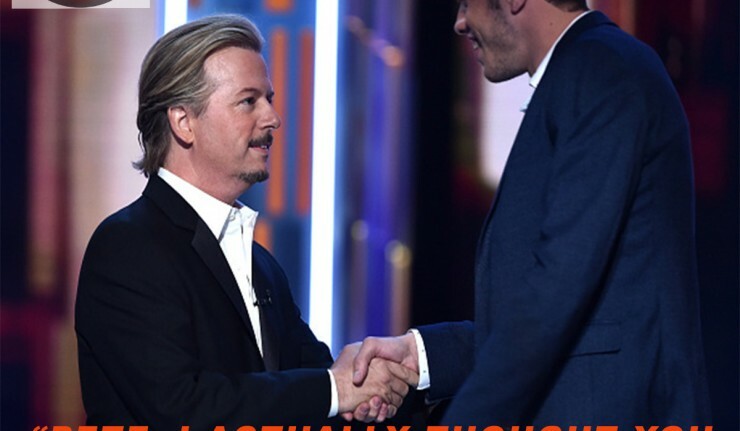 David Spade and Pete Davidson during the Comedy Central Roast of Rob Lowe. Davidson himself has made 9/11 jokes about his dad and even credits the dark times for helping him hone his craft. What did you think of Spade’s joke? Did it go too far or is all material fair during a roast with someone who has no limits himself? Vote and comment below. Pingback: Mattress Company Blasted For 'Tasteless' 9/11 Commercial - Is It Funny or Offensive?